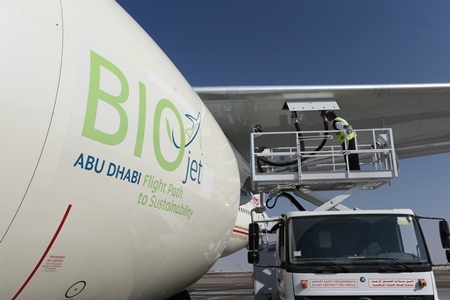 Boeing, Etihad Airways, Takreer, Total and Masdar Institute of Science and Technology today announced they will collaborate on a new initiative, BIOjet Abu Dhabi: Flight Path to Sustainability, to support a sustainable aviation biofuel industry in the United Arab Emirates. Pictured here, Etihad Airways conducted a 45-minute demonstration flight on Jan. 18 with a Boeing 777-300ER (Extended Range), powered in part by the first sustainable aviation biofuel produced in the U.A.E. ABU DHABI, United Arab Emirates, Jan. 19, 2014 /PRNewswire/ -- Boeing [NYSE:BA], Etihad Airways, Takreer, Total and the Masdar Institute of Science and Technology today announced they will collaborate on a new initiative to support a sustainable aviation biofuel industry in the United Arab Emirates.